I got back out to the zoo on Friday and had some fun taking pictures of the snow leopard. Unfortunately the enclosure is much less photogenic. I don’t think any of these pics ranks up with the ones from before, but let me know in the comments if you feel differently. I have to admit though the juxtaposition of the duck and the sign still cracks me up though. We, as a family, were just now watching the birds at the bird feeder out back. We were telling Nate what kinds of birds we saw, and he was all excited saying “chickadee” over and over (for every kind of bird). Suddenly he asked us “Big Bird?”, as in ‘is Big Bird coming to the feeder?’. We giggled, and told him no, but agreed that it would be pretty cool if he did. Earlier this week there was an especially beautiful day on tap so I took off work early and we went to the zoo. This was our first time to the Rosamond Gifford Zoo in Syracuse. Nate seemed to notice the animals when they would move around and would get fairly excited. The rest of the time he would watch people walking by and point to things that caught his eye. I, of course, took the opportunity to photograph the various animals and birds. This was a lot of fun, and quite challenging as most of the indoor environments were quite dark. The 70-200mm got quite a workout and I ventured into ISO settings that I normally don’t dare to use. In the end, quite a few shots were pretty compelling, but are not the highest quality due to noise or lack of sharpness from the lighting. As we were about to leave, we noticed that on of the she-lions was right up against the Plexiglas. This was a nice opportunity to get closer to a lion than I remember being before. Take a look at the gallery, here are some highlights. The wind was blowing hard, which really cut down on the number of birds that were around. I didn’t realize that the bird count had started today, or I would have counted this morning which is the most popular time at the feeders. I’ll count tomorrow morning and enter those totals also. SO.. I’m working in the bathroom (K & I are remodeling the bathroom but that’s another story), and the window is open and I hear this little ‘plink-plink-plink-plink’. It seems to be coming from outside… I open the window and stick my head out to look around… We have nuthatches and woodpeckers attacking the facia boards on our house to get to the bees and wasps underneath… but I check all along the roofline… and nothing. The sound seems to be coming from our bird feeder (which is below me from the upstairs window). There’s no bird or squirrel at the feeder. Sure enough a short walk outside revealed that a chickadee had managed to get trapped INSIDE our bird feeder. 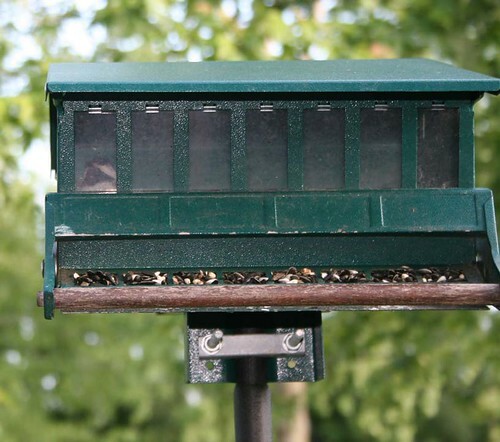 “PLINK-PLINK-PLINK flutter-flutter” says the chickadee by pecking against the feeder and flapping to no effect. After I carefully opened the feeder, the chickadee immediately alighted on a nearby branch and issued its standard “CHICK-a-dee-dee” call. It was immediately joined by a black-capped friend and the two chittered back and forth for a few seconds. After 30 seconds or so they both flew off and I lost track of them. So your call: Prison or Paradise?